These are tables of congressional delegations from New Mexico to the United States House of Representatives and the United States Senate. 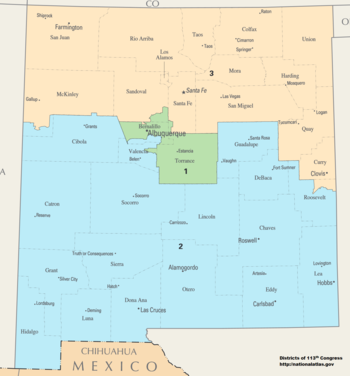 List of members of the New Mexico United States House of Representatives delegation, their terms in office, district boundaries, and the district political ratings according to the CPVI. The delegation has a total of 3 members, all 3 of whom are Democrats. Tables showing membership in the New Mexico federal House delegation throughout history of statehood in the United States. 1 Election law in New Mexico prior to 1960 dictated that if a seat was vacated by resignation or death, the term would expire naturally without a special election. This law was changed due to the close proximity of Representatives' Antonio M. Fernández and John J. Dempsey deaths on respectively November 7, 1956 and March 11, 1958, leaving New Mexico with only one U.S. Representative for an extended length of time. 2 Néstor Montoya died January 13, 1923. 3 Antonio M. Fernández died November 7, 1956, just hours after being re-elected to an 8th term. 4 John J. Dempsey died March 11, 1958. 5 Steven Schiff died March 25, 1998. Tables showing membership in the New Mexico federal Senate delegation throughout history of statehood in the United States. As of September 2017[update], there are two former U.S. Senators from the U.S. State of New Mexico who are currently living at this time, both from Class 1. This page was last edited on 26 March 2019, at 15:14 (UTC).